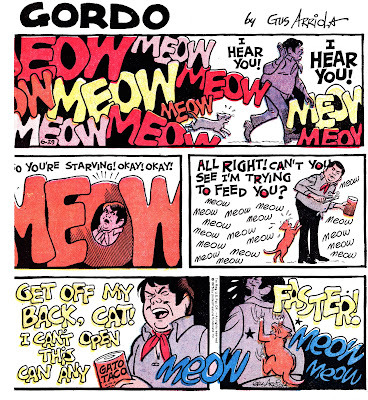 A recent discussion about the beauty of Gus Arriola's Gordo, made me go and clean up the many different scans of that strip I had on my office computer. These are sample from almost all periods of this strip, except the earliers version during the first years of WWII and the late forties ones from when he came back from service and restarted it. Right from the start, the strip always had a stylized look. Arriola was trained at Disney, but although his characters are very animated, I suspect they would be very hard to actually animate, because of their stylized rendering. 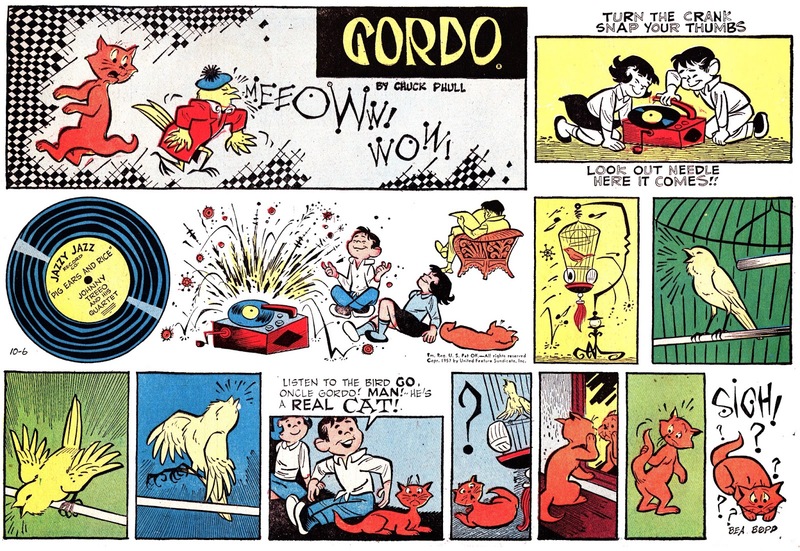 The best period for me is (what else would it be) the late fifties and early sixties, when the stylization was becoming spectacular without it being used as a way to make up for the smaller size of printing (as in the seventies and eighties). 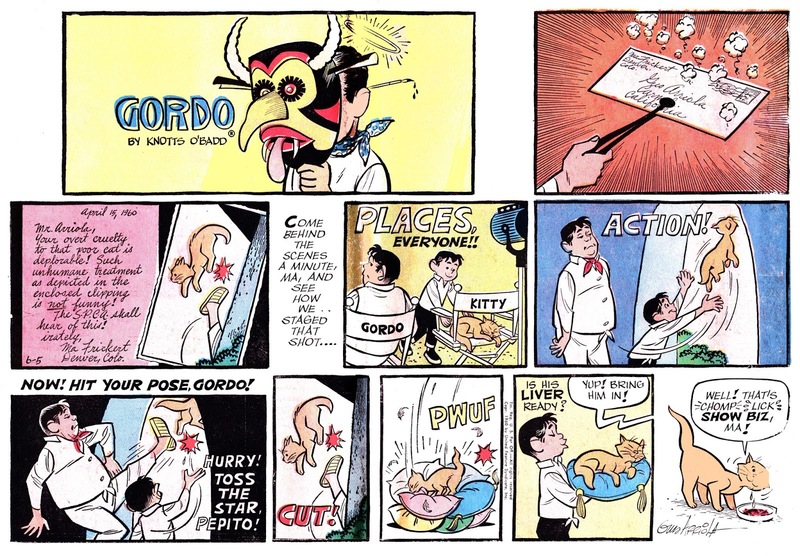 El Gordo, created by Gustavo Arriola in 1940, who, with the years passing, included a revolutionary artwork in the strip, until his retirement in 1986 (when the FIFA World Cup was being held in his homeland, Mexico). 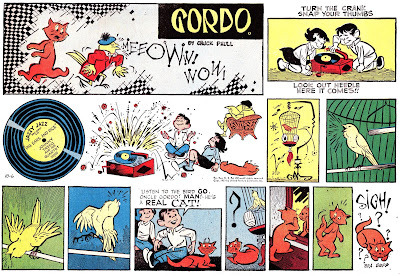 I've read about his retirement in the Cartoonist ProFiles magazine (edited by the late Jud Hurd), where several cartoonists paid a tribute to him (among them, Hank Ketcham [Dennis The Menace]). Really beautiful stuff. 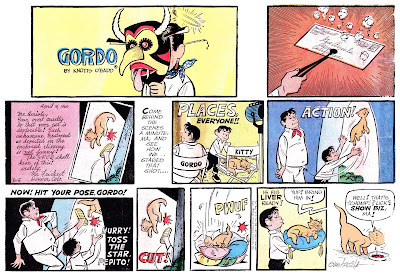 Amazing Arriola always kept the strip contemporary looking, it never looked stodgy and dated like so many other long running strips. Those Disney trained artists sure were super-human! Seeing the El Gordo (how this strip is known here in Brazil) Sunday page from December 16, 1979 (drawn by Gustavo Arriola), I could notice that "palomitas" is how the popcorn is known in Spanish. I also noticed that the popcorn is also known in Spanish as "pochoclo".